Ford is in talks with a chemical company about using its Bridgend plant to build a new off-road vehicle. Ineos Automotive plans to build a car to replace the Land Rover Defender, which went out of production in 2016. Talks come a week after Ford told staff working on the new Jaguar engine not to come to work for five days. 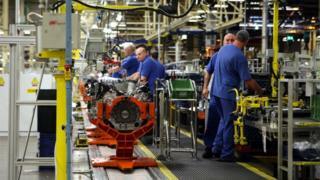 Ford employs 1,850 people in Bridgend, though there have been concerns about the plant's long-term future. The car giant will stop producing engines for Jaguar Land Rover in 2020 and the Bridgend plant is looking for business in the globally competitive car industry to replace the work and secure the future of its staff. However, documents previously leaked to the BBC have shown the cost of producing an engine in Bridgend is significantly higher than Ford's Dagenham plant. Ineos Automotive is the brainchild of the chemicals firm's chairman, Jim Ratcliffe - Britain's richest man. According to the Financial Times, discussions are currently under way about building the new vehicle in Bridgend. The BBC understands the talks are at an early stage and Ineos has not commented on the reports, while Ford said it continued to look at high-technology opportunities for the future.